Give the sweetest Valentines ever with a scrumptious little pack of treats to make, eat and share. From tempting heart-shaped truffles to gorgeous decorated cards, show a special someone that you care! 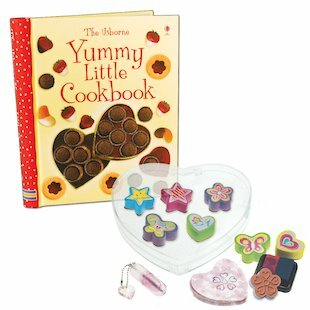 The Yummy Little Cookbook is full of delicious ideas for sweet delights to make and give – this day or any day! And with your own heart-shaped stampers and stationery, you can decorate cards and notes, sending out the prettiest greetings to all your friends and crushes. Treat yourself – and everyone you love! I made some of these for my sister because her birthday is on Valentines day. I love the recipies in that book. When ever my friends come round we always make stuff from here.